Not every person has enough merit to be able to meet a spiritual master. Even less people manage to meet a qualified master who has attained realization in the stages of the path. We are part of this few people. In this life, we are blessed to be guided by Venerable Dagpo Rinpoche, a great master of an authentic lineage who has realized the Stages of the Path to Enlightment. This is a fortune way greater than a wish-fulfilling jewel. However, have we truly savored the meaning of this fortune? A spiritual master is very important in our lives. A spiritual master teaches us how to differ between right and wrong, good and evil. When one of our feet is ready to fall into the pit of suffering, our master pulls us up and protects us so we would not fall for a second time. Our spiritual master loves us unconditionally, no matter what a bad person we are. The master will never give up on guiding us so we become a better person. No matter how bad we are, our master will never give up on guiding us down the path to liberation. I have wandered for a long time through cyclic existence, and they search for me; I have been asleep, having been obscured by delusion for a long time, and they wake me; they pull me out of the depths of the ocean of existence; I have entered a bad path, and they reveal the good path to me; they release me from being bound in the prison of existence; I have been worn out by illness for a long time, and they are my doctors; they are the rain clouds that put out my blazing fire of attachment and the like. That is what Dagpo Rinpoche has been working on for more than 25 years he teaches the Dharma in Indonesia. That is what Rinpoche has done for us. Even so, have we always remembered our spiritual master and practiced his teachings in everything we do? What kind of life would we have if we had never met Rinpoche and Lamrim? A thousand years ago, Lord Atisha went through a dangerous voyage across the ocean for thirteen months for the sake of receiving teachings from Guru Svarnadvipa. Meanwhile, in this modern age, Rinpoche has to go through the tiring flight from France to Indonesia every year just so he can teach us. Have we appreciated our chance to meet him and receive his teachings? Rinpoche’s age is over 80 years old. Not long ago, he caught a mild heart attack and has to undergo rehabilitation in France. 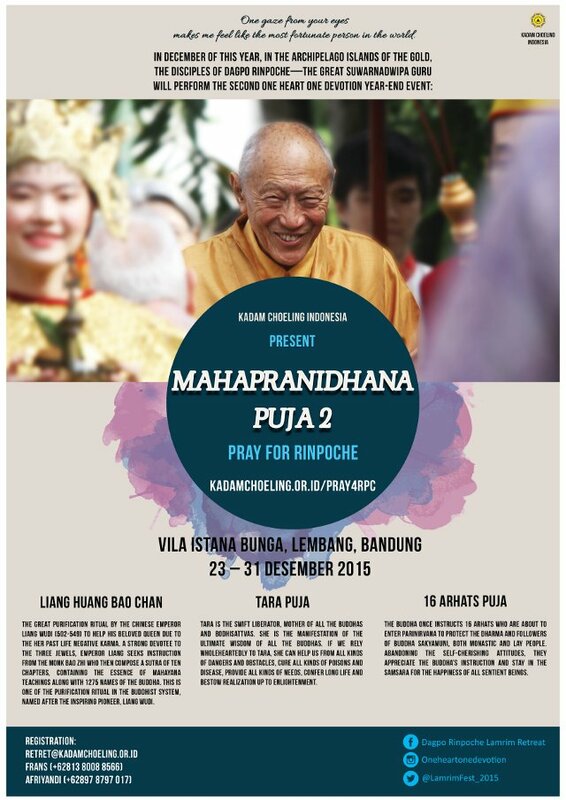 Hence, Rinpoche cannot come to Indonesia this year. We all know for a fact that a master’s long life and health depend on the pupils’ merit. We must utilize this moment to reflect on how important Rinpoche is to our lives. After recalling the kindness of the master and how much we truly need him, we should sincerely collect a lot of merit and pray so our spiritual master would live a long life, be healthy, and always be by our side in this life and the future ones. As a form of our devotion to our spiritual master, Kadam Choeling Indonesia invites all of you to create a massive merit together in Mahapranidhana Puja 2 on December 23-31, 2015, at Villa Istana Bunga, Lembang, Bandung. The main activities in Mahapranidhana Puja 2 are reciting Liang Huang Bao Can sutra to purify us from our misconducts, Tara Puja to eradicate all form of obstructions, and 16 Arhats Puja. You can also participate in collecting 100.000 Heart Sutra recitations and One Million Lights for One Wish offering. Good deeds carried on by a large number of people will create a strong positive energy, hence generating multiplied merits with the power to make our prayers come true. All this merit will be dedicated to the long life of our spiritual master, Dagpo Rinpoche. This is the chance for us to give form to our gratefulness to the master who touches our lives and our supplication so we would never be apart from a spiritual master along the way to enlightenment. Further information about donation packages can be found HERE.